This saga begins in March, when I returned from Florida visiting Barry. I received a notice that the property is in violation due to weeds in the gravel in the front yard. I contact the landlord, as I wasn't aware that it was my responsibility. He assures me that it is and I spent about 3 hours on my hands and knees pulling weeds, that were the direct result of our Spring rains. Problem solved. About 2 weeks later, I get a notice saying since I ignored the previous warning, the HOA is accessing a 150 fine for the violation and sent along a picture of the property prior to my picking out the weeds. I documented it all and sent it to the landlord, who agreed he'd indeed look into it. No reply from him, so I assumed the problem was resolved. Obviously, I'm renting this place and when I signed the lease, I had no idea that yard maintenance was part of the deal, however upon inspecting my lease, I see where the sneaky landlord snuck in a addendum saying I would agree to pay any and all violations of the HOA's rules. Last Friday, I received yet another fine for $150 and I sent it to the landlord explaining that there were indeed NO weeds and included a picture of the front yard. I mention that I feel like I'm being harassed and to please do something about it. I'm attaching the picture of the yard that was taken last Friday. This is the email I received a week later from my bullying landlord and his attempts at extortion. 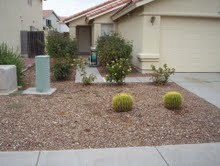 The photo attached to your email shows numerous weeds in the yard. You are well aware that this is a violation of the HOA rules. Your lease clearly states that you must adhere to the HOA rules. Your lease also clearly states that you are responsible for any fines incurred as a result of HOA rules violations. There have been three violations of this HOA rule this year prior to this one. I took care of the fine with the HOA for the violations in March. I have no choice but to enforce the terms of the lease. Please mail to me the $150 fine so that I can get the HOA paid. If I do not receive the $150 by the end of this week, I will provide to you a five-day notice to make said payment. If after five days, payment is not made by you, I will begin eviction proceedings for violating the terms of the lease. Please keep the yard free of weeds in order to avoid future violations from the HOA. I've NEVER in my entire life been accused of not keeping things neat and clean. I've NEVER been in a position where someone can blatantly threaten me with homelessness. I've NEVER been the victim of a bully before either. I told my friend Barry of my dilemma and Barry is a wanna be lawyer and very intelligent. He spent hours researching AZ leases and determined that my lease is invalid, because in AZ, a landlord cannot reassign the agreement of an HOA to a third party without compensating them in the lease and my lease doesn't say, "In lieu of payment received, tenant agrees to abide by rules and regulations of the HOA". BUT, who wants to go to court over $150? Here's the other thing. I pay my rent on the 20th of every month for the following month like clockwork. Who in their right mind is willing to lose a renter, in this economy, that pays as diligently as me? Comments are welcome, as well as advice.